As we saw with Schmedrick’s ukulele, string instruments make use of vibrations on strings where each end is a vibrational node. The strings themselves don’t move much air. So, either an electrical pickup and amplifier are needed, or the strings must transmit vibrations to the body of the instrument in which sound waves can resonate. 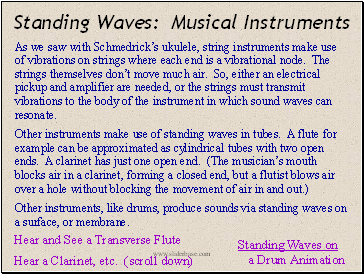 Other instruments, like drums, produce sounds via standing waves on a surface, or membrane. Real sounds are rarely as simple as the individual standing wave patterns we’ve seen on a string or in a tube. Why is it that two different instruments can play the exact same note at the same volume, yet still sound so different? 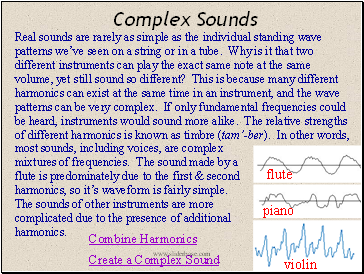 This is because many different harmonics can exist at the same time in an instrument, and the wave patterns can be very complex. If only fundamental frequencies could be heard, instruments would sound more alike. The relative strengths of different harmonics is known as timbre (tam’-ber). 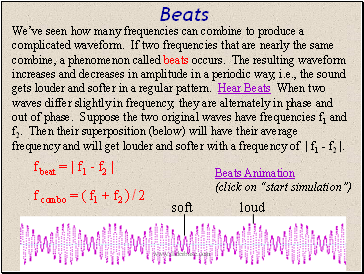 In other words, most sounds, including voices, are complex mixtures of frequencies. The sound made by a flute is predominately due to the first & second harmonics, so it’s waveform is fairly simple. 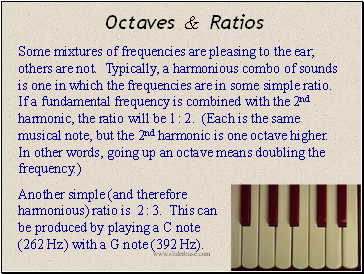 The sounds of other instruments are more complicated due to the presence of additional harmonics. Another simple (and therefore harmonious) ratio is 2 : 3. This can be produced by playing a C note (262 Hz) with a G note (392 Hz).